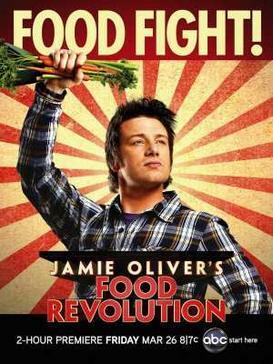 Jamie Oliver’s Food Revolution – I Love it! I have been following the progress of the Food Revolution for some time, and the achievements this group has made in terms of education and getting better foods into schools is just exciting, in my opinion. I sent the link for my blog over to the nice folks at the Food Revolution, and they invited me to send in a “guest blog post”. And the best part — they actually published it! It felt so amazing to describe what the Food Revolution meant to me and my family, and even more amazing to see the number of people who read it and posted supportive comments. The post is called A Recipe Resolution — Tying Memories to Great Food.